First off, a lot of sites are using a screen capture of the bar owner which makes him look evil – that’s unfair, so I chose a still from the video at this link, showing the ladies who won their case instead – thinking positive. I’m uncertain why the ladies want to eschew the money and get a Supreme Court ruling – there is no case worthy of the Supreme Court here – a State passes a non-discrimination law, someone violates it, they get a fine, they don’t appeal. This is a moot case now. Take the money, ladies, and raise your glasses in a toast to your successful fight. Give the money to the community if you don’t want it; I know from a friend that Oregon has a high number of transgender folks who are homeless, for instance. 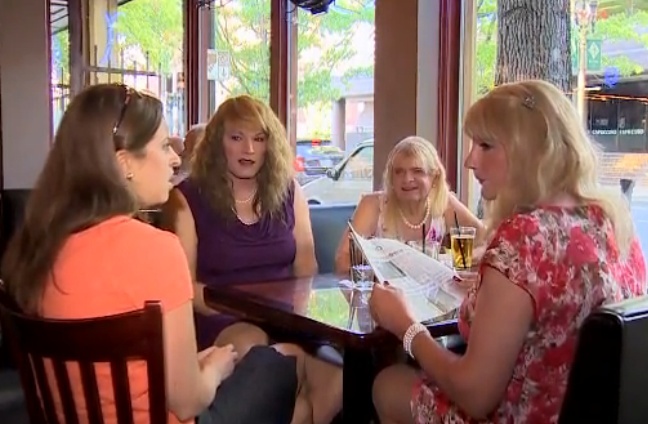 Note that although the newspaper in the background graphic incorrectly describes the ladies as “crossdressers”, the video keep the terms correct. Bar has to pay $400,000 for telling transgender patrons to stay away | Local & Regional | KATU.com – Portland News, Sports, Traffic Weather and Breaking News – Portland, Oregon. This entry was posted in Activism, Legal and tagged discrimination, oregon on September 1, 2013 by .